Wild Boar has a nutty, sweet flavour. Can be prepared like pork but has a more natural taste and is lower in fat. Individual fillet sizes: 125g, 150g and 180g. All the meat we sell has been prepared in our own on farm butchery to ensure our Customers receive the best quality produce available. 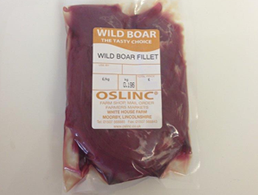 Our Wild boar fillets are supplied vacuum packed for freshness and offer a low fat alternative for those who enjoy Pork but want a tastier,more natural product that is lower in fat too.